Targets & Tones Hard to Reach Areas! Get fabulous arms in just minutes a day with the all new Wonder Arms! BLACK FRIDAY SALE! SPEND $50 OR MORE GET 10% OFF! 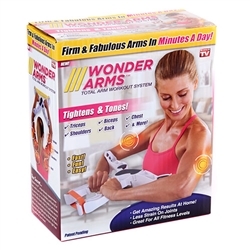 Get fabulous arms in just minutes a day with the all new Wonder Arms! The secret is the special dynamic resistance movement! Wonder Arms will strengthen all muscle groups in your arms and even your chest. People of all fitness levels will find Wonder Arms to tighten and tone their arms in only minutes a day! Includes 3 power resistance bands and workout & nutrition guide!